Every once in a while, a piece of public art comes along that’s so captivating, it seems like everyone wants to see it. And as it turns out, creating such a piece of art requires nothing more than some big boulders, a few gallons of fluorescent paint, and a very good sense of balance. Seven Magic Mountains, south of Las Vegas, is remarkably simple but totally fascinating. 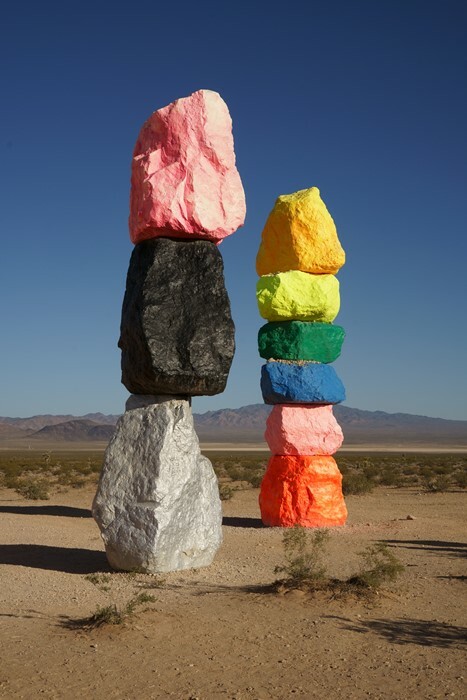 Seven Magic Mountains is located off Interstate 15, however, there is no nearby exit. If you’re coming from Las Vegas, take exit 15, then turn left, then right, and you’ll be on the I-15 frontage road (also called Las Vegas Boulevard — yes, this is the very, very south end of The Strip). If you’re coming from California, take exit 12, turn right then left, and you’ll be on the frontage road (which is STILL called Las Vegas Boulevard, all the way down here). Seven Magic Mountains is roughly halfway between the two exits, and there are signs to help you find it. I love to visit a place where everyone is happy. Such places are rare, but this is definitely one of them. You’re in the middle of the desert, it’s blazing hot, and you’ve driven all this way to see stacks of rocks. And yet, everyone is smiling. Seven Magic Mountains was opened to the public in 2016. 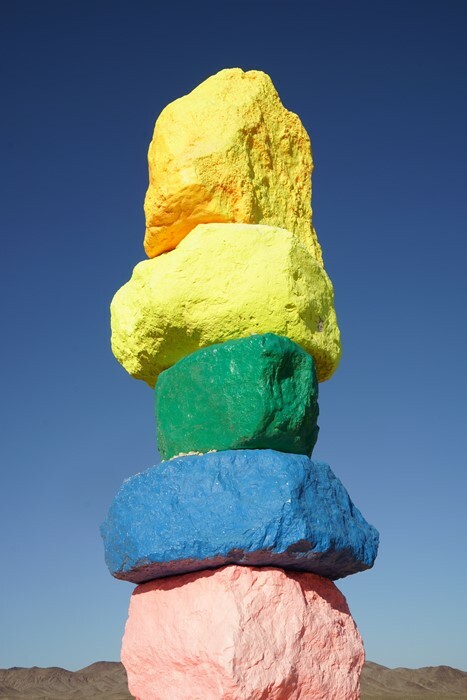 It was created by Ugo Rondinone, a famed artist who often uses colorful rocks in his sculptures. He designed Seven Magic Mountains to be positioned between the natural (the surrounding mountains) and the artificial (Interstate 15 traffic). The “mountains” are roughly 35 feet high, made with rocks quarried from nearby sources, and the whole thing cost $3.5 million. 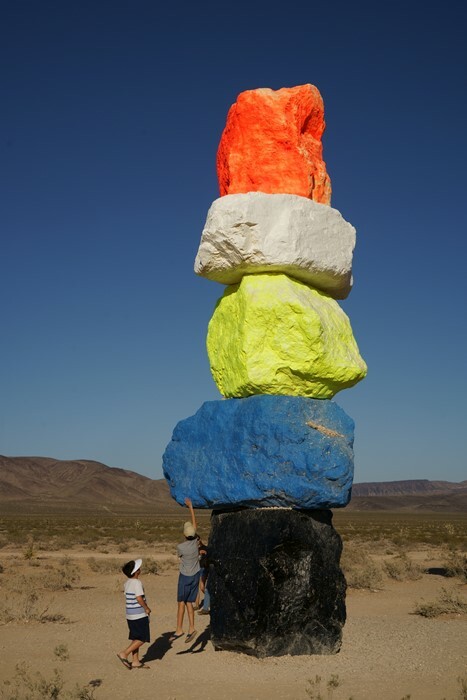 The deep thoughts and artistic vision that led Rondinone to paint and stack huge rocks in the desert will probably be lost on most visitors. I’m guessing most visitors, like me, just wanted to take some pictures for Instagram. Thank goodness there’s 4G out here in the middle of nowhere. The real trick is taking a picture without other random people in the frame. When I visited, there were easily a hundred or more people swarming around the mountains, and everyone seemed oblivious to everyone else’s efforts to take a picture. I did capture a few lucky shots, but it wasn’t easy. Of course, you can always crop down the photo, just above everyone’s heads. I had a hard time taking a picture of all seven mountains, without one being behind another. The trick is, I’ve since figured out, is to not follow the path that takes you straight to the rocks. Instead, head out into the desert, and stand between the rocks and the highway. There, you should find a clear shot of all Seven Magic Mountains, without one getting in the way of the other. Oh, and I’d also suggest going very early or very late in the day, just to avoid the crowds. The best time should be just before sunset, when the manmade mountains and the natural ones behind it are all nicely lit by the sun. You’ll probably still need to photoshop out some people, though. 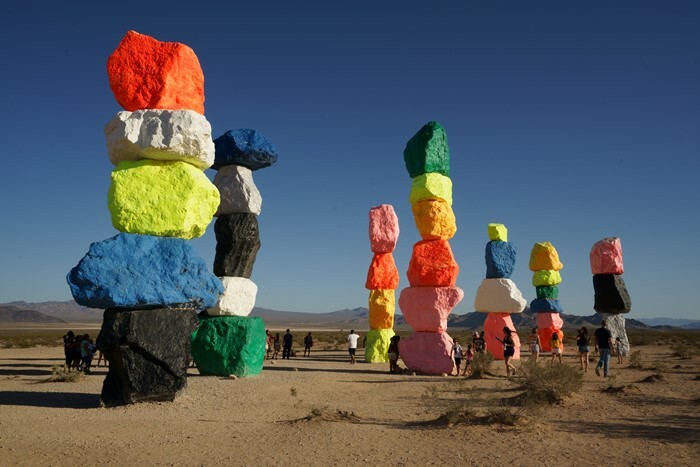 The future of Seven Magic Mountains is unclear. It was meant to stand for just two years. That date has been extended to the end of 2018. There is an interest in keeping it around longer, but doing so will require an investment and a long-term plan, according to a story in the Las Vegas Review-Journal in February 2018. Seven Magic Mountains is one of the most enjoyable public art installations I’ve seen in a while. It’s worth the drive from Las Vegas or the detour off Interstate 15. Because its future is uncertain, be sure to see it sooner rather than later.